This is a sheet of license plates for scale model cars in scale . These are suitable for use on any car model in a comparable scale. This sheet is printed on photo paper using photo dyes for durability. 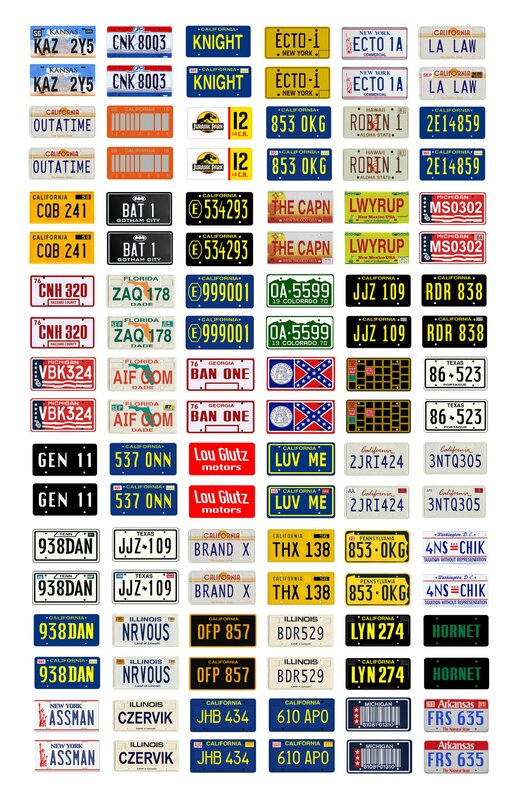 These replicate in scale license plates seen on cars in various movies and TV shows, including Bullitt, Beverly Hills Cop, Batman, Smokey and the Bandit, The Dukes of Hazzard, Herbie the Love Bug, Robocop, Back to the Future, Death Proof, Emergency, Jurassic Park, Caddyshack, The Blues Brothers, and many more. This sheet includes 54 different pairs (108 tags total).